The advantage of cellular communication like GSM technology is a potential solution for such remote controlling activities. GSM-SMS technology can be used to control household appliances from remote places. Remotely, the system allows the homeowner to monitor and control his house appliances via his mobile phone set by sending commands in the form of SMS message and receiving the appliances status as well. This system provides ideal solution to the problems caused in situations when a wired connection between a remote appliance device and the control unit might not be feasible. The system is wireless and uses the user’s mobile handset for control and therefore the system is more adaptable and cost effective. The system uses GSM technology thus providing ubiquitous access to the system for appliance control. With this hypothesis, three different approaches have been proposed and implemented in this project; FIRSTLY, home control switch/household appliances are controlled by server mobile which acts as remote control. SECONDLY, GSM-SMS messaging technology is used to control them from remote places and FINALLY, to provide a multiple agents environment. Nowadays, people’s expectations in their life quality are increasing as the technology is improving rapidly. People need an affordable system (smart) that can make their lives easier, more comfortable, and offer more safety.GSM based home automation system is an electrical and electronic system designed to control home appliance with a mobile phone. The two main technologies applied in the system are GSM and PLC. GSM stands for global system for mobile communication and PLC stands for power line communication. In this study, Nokia 6100 is chosen as the GSM phone that receives command and transfers it to controller. Due to rapidly advancing of mobile communication technology and widely availability make it possible to incorporate mobile technology into home automation systems. ’’AT’’ command is used as communication between GSM phone and microcontroller by passing through a serial interface RS232 with the help of its driver. The project is based on the principle of GSM network, which enables the user to remotely control the operations of the appliances by using a mobile phone. In other word it would transform a normal home into an intelligent home. The controlling circuit is the most important component in communication and interface between home appliances. It was implemented by using peripheral interface controller (PIC) interfaced to mobile phone. The user can perform ON/OFF operations of the appliances just by pressing keypad of mobile phone. The user sends GSM data in the form of SMS (short message service) message to switch ON or OFF any appliances at home such as lamp, air condition, fan and etc. the appliances may also provide the user with its current ON/OFF status. The system can be improved to provide the user with information about the status of each appliance. 1. To design and develop home appliances control system over GSM network by using a mobile phone. 2. To determine and understand on how the GSM works. 3. To understand the architecture and programming of the PIC. 4. To learn the troubleshooting and techniques. 1. Mobile phone with SIM card enables the user to remotely control the operations of the appliances by communication to the GSM modem. 2. GSM modem allows the capability to send and receive SMS to and from the mobile phone. 3. RS-232 is the basic serial communication cable that will be used to interface between GSM modem and PIC microcontroller. 4. PIC microcontroller will be interfaced to the control circuit that is connected to the appliances. It contains the software components through which the appliances are controlled and monitored. 5. Relay and control circuit used to detect and control the condition of the home appliances. The system works as a remote sensing for the electrical appliances at home or industry to check whether it is ON or OFF, at the same time the user can control the electrical appliances at home by sending SMS message into the system, for example, turning on the AC before returning home. in case of fire/security the chip will receive signals from the different sensors in the monitoring place and acts according to the received signal by sending an SMS message to user’s mobile phone, it also works as automatic and immediate reporting to the user in case of emergency for home security, as well as immediate and automatic reporting to the fire brigade and police station according to activated sensor to decrease the time required for tracking action. 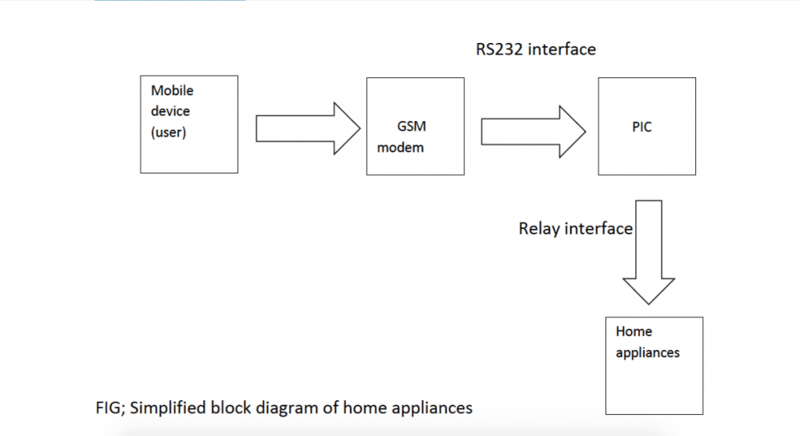 A sketch of overall design of the home appliances control using GSM is shown in the figure below. FIG: Simplified block diagram of home appliances Control using GSM. It can be implemented to any levels of the security system. The architecture of the system mainly consists of three components the GSM MODEM and the Mobile device (user) GSM modem PIC Home appliances interface circuit that include the different sensors used. The function of the GSM MODEM is the remote communication between the user and the controller through the RS232 serial communication standard. The function of the controller is to continuously check the inputs coming from the different sensor and send message through the GSM network in case of emergency such that it acts as a 24hours monitoring and continuously checking for any received message from the user through the GSM MODEM to switch on the AC for example. Alkar, A. Z. & Buhur, U. (2005). An Internet Based Wireless Home Automation System for Multifunctional Devices. IEEE Consumer Electronics, 51(4), 1169-1174. Delgado, J.C.M. & Nunes, J.C. (2000). An Internet application for home Automation, Electrotechnical Conference; MELECON 10th Mediterranean, Vol. 1, pp. 298 -301. Fujiyama, H. (2006). System-on-a-chip with security modules for network home electric appliances, Fujitsu Scientific and Technical Journal, 2 System-on-a-Chip, vol. 42 pp. 227-233. Neng-Shiang Liang, Li-Chen Fu & Chao-Lin Wu. (2002). An integrated, flexible, and Internet-based control architecture for home automation System in the Internet era, Proceedings ICRA. IEEE International Conference on Robotics and Automation, Vol. 2, pp. 1101 –1106. Luo Ren C., Hsu Te Y., Lin Tung Y. & Su Kuo L.(2005). The development of intelligent home security robot: Proceedings of the IEEE International Conference on Mechatronics, ICM ’05, pp. 422-427. Rifat, S. Enamul, H., S.M. Sohan & Iftekhar Naim. (2008). Remote Controlling of Home Appliances using Mobile Telephony, International Journal of Smart Home, Vol. 2, No. 3. Sriskanthan, N. & Tan, K. (2002). Bluetooth Based Home Automation Systems, Journal of Microprocessors and Microsystems, Vol. 26, pp. 281-289. Yang Lili, Yang Shuang-Hua, & Yao Fang. (2007). Safety and security of remote monitoring and control of intelligent home environments, Proceedings – IEEE International Conference on Systems, Man and Cybernetics ,Vol. 2 pp 1149-1153.